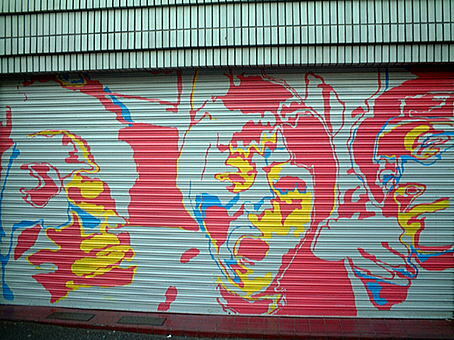 We painted a mural on the shutter as one of our activities against illegal graffiti. 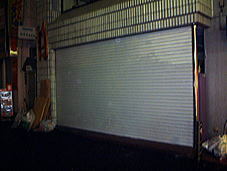 The shop's shutter (4.8m*2.4m) is located in front of the Shimokitazawa Station in downtown Tokyo, which is one of the most badly damaged places by graffiti in Japan. 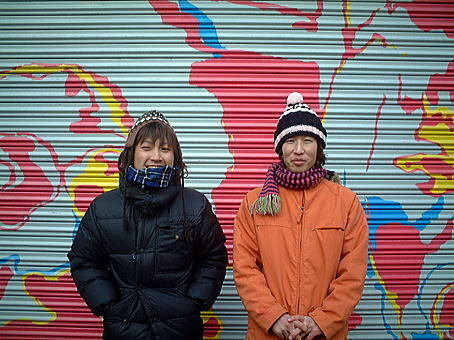 This activity was worked mainly by Yuta Kamio who was a leader of the Graffiti Research Group at Kobayashi Laboratory. 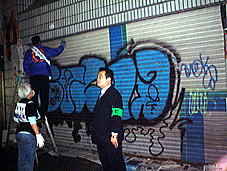 We (Kobayashi and Kamio) attended several meetings of the anti-graffiti committee in Shimokitazawa District from May 2003. Shimokitazawa is a capital of teenagers and there are eccentric clothing stores, funky restaurants, matchbox playhouses and live-music clubs. Musicians, designers and actors have settled in the area. We had been considering that only cleaning out the graffiti would not be appropriate for this town and another action would be needed to activate the town. Then we proposed a painting activity on graffiti-covered shutters. Our proposal was different from the mural arts activity and 'Legal Wall' project which permitted free painting by young graffiti writers. The Legal Wall has been adopted in western countries for many years, but most of them failed to decrease graffiti around the wall. We negotiated with the town mayor and shop owners to paint on several shutters as a sample of our proposed activity. 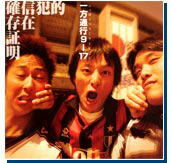 In October 2004, we participated in the erasing graffiti activity in Shimokitazawa. The painting should be not only beautiful but also appealing to residents, and we thought that it would be nice to describe the people who acted as artists or musicians in Shimokitazawa. We decided to pick up three young guys who were members of an amateur rock band, 'One Way 9→17', and mainly acted at live-music clubs in Shimokitazawa. We could do painting only after the shop closed at 10pm. From 11pm on Jan. 6, 2004, we began drawing an outline using a projection of the image. From 2am on Jan. 7, 2004, we began putting the main color, pink, paint on the wall. At 10am on Jan. 7, we finished the first night's painting. From 1am on Jan. 8, 2004, we began putting blue and yellow paint on the wall. At 5am on Jan. 8, we finished the second night's painting. From the middle of night on Jan. 10th, we fixed the painting in detail and finally, it was completed at 7am. We considered the painting would be in harmony with the environment.